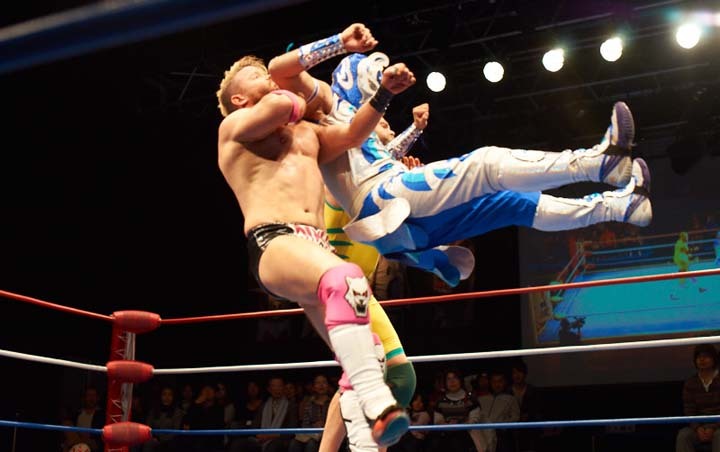 Ryukyu Dragon pro-wrestlers have all the right moves in their repertoire to entertain audiences minus violence and blood making it suitable for whole families to enjoy. Ryukyu Dragon, Okinawa’s own pro-wrestling troupe, is scheduled to have a charity event “Ryukyu Dragon Champuru” this Saturday at the Okinawa Comprehensive Athletic Park gym. The team members perform their show under the slogan “Dream, Courage, Excitement and Smile by pro-wrestling.” Children from local orphanages and disabled children are special invited guests at the charity event. A portion of the revenue from the event will be donated to Okinawa City Council of Social Welfare. The Ryukyu Dragon Pro-wrestling is the only show-wrestling group on the island. The team started in April 2013, and is based at Naval Kadena Arena in Kadena Town. The troupe performs at various events across the island in addition to their regular shows on their home arena in Navel Kadena. a couple of woman wrestlers and foreign players are named after local products and popular sights on Okinawa. They entertain the audience without engaging in violence or bloody fights. In addition, they often go out to perform at charity events, visit orphanages, children’s homes and facilities for the disabled. They actively visit children at hospitals, nursery and pre-schools, elementary schools and welfare facilities. Doors to the venue open at 4 p.m. and the show starts an hour later at 5 p.m. Tickets to the event are ¥7,000 for special ring side seats, ¥4,000 ~ ¥5,000 for reserved seats and ¥3,000 for non-numbered general seats in advance. Add ¥500 at door. Tickets for junior high and high school age children are ¥2,000 in advance and ¥2,500 at door. Seniors and disabled persons pay ¥2,000 in advance and ¥2,500 at door. Elementary school age children’s tickets are ¥1,000 in avance and ¥500 more at door. Advance tickets are on sale FamilyMart e-plus / Lawson Ticket (Lcode; 86732) / FM Yomitan and TSUTAYA Shintoshin store.